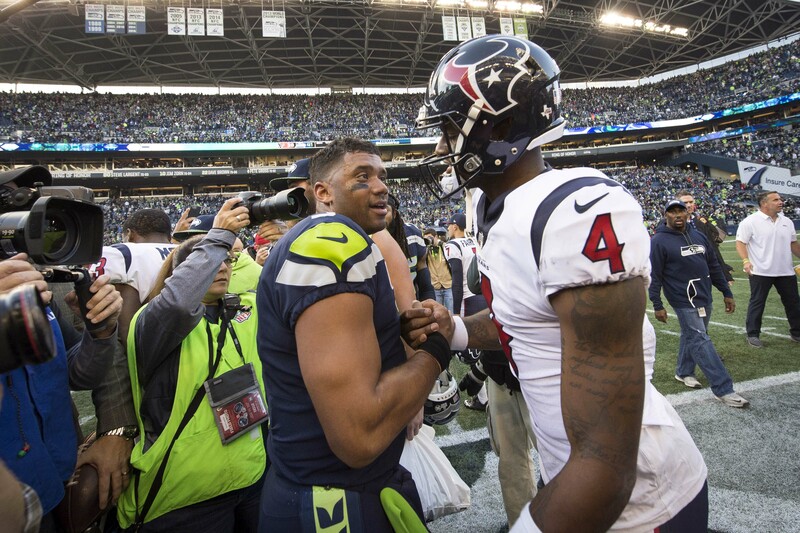 SEATTLE (AP) — No matter how much Deshaun Watson impersonated Russell Wilson on Sunday, the original ended up coming out on top. Wilson hit Jimmy Graham for an 18-yard touchdown with 21 seconds left, his second TD catch of the fourth quarter, and the Seattle Seahawks rallied for a wild 41-38 win over the Houston Texans on Sunday. Down 38-34 with 1:39 left and out of timeouts, Wilson took Seattle 80 yards in barely a minute. He hit Paul Richardson for 48 yards on a jump ball to start the drive, found Tyler Lockett for 19 yards, and drilled a strike to Graham for the winner. Wilson finished 26 of 41 for a career-high 452 yards and four TDs. He hit Richardson for two TDs and found Graham on a 1-yard TD pass with 5:41 left. Watson was nearly the equal of Wilson, throwing for 402 yards and four touchdowns. But he couldn’t come up with a final answer and was intercepted by Richard Sherman with 7 seconds left on a desperation throw. It was a stunning performance by Watson against one of the best defenses in the NFL — and an even better final rally by Wilson. Watson threw touchdown passes of 59 and 20 yards to Will Fuller, 2 yards to Lamar Miller, and a wide receiver screen that DeAndre Hopkins took 72 yards for a score with 5:01 left to give Houston a 38-34 lead. Watson is the first rookie to throw at least three touchdown passes in four consecutive games. His 16 touchdown passes in his past four games are the most by a rookie in any four-game span. This season, Watson has 19 passing touchdowns, the most by a rookie in his first seven games of a season. Wilson and the Seahawks had two chances late to rally. Wilson drove the Seahawks to the Houston 20 with 2:55 left, but Marcus Williams intercepted at the Houston 6, undercutting a pass intended for Richardson. Seattle forced Houston to punt and this time Wilson didn’t make a mistake. Wilson was the entirety of Seattle’s offense. He accounted for 482 yards running and passing. Seattle had 3 yards rushing from someone other than Wilson. Earl Thomas also returned an interception 78 yards for a touchdown in the first quarter. Hopkins finished with eight receptions for 224 yards, while Fuller had five catches for 125 yards. The day started with the majority of Houston’s roster kneeling during the national anthem in protest of owner Bob McNair’s “inmates running the prison” comment that emerged this past week. Only 10 of Houston’s active players stood for the anthem. But if there was concern the discussion about a protest would distract the Texans, it was put to rest almost immediately. Watson and Fuller connected on the first of their two TDs on Houston’s opening drive, igniting an unexpected shootout between the quarterbacks. The two QBs combined for eight TD passes and 854 yards passing. Seattle’s run game was again nonexistent. The Seahawks finished with 33 yards rushing on 21 carries. Wilson led the way with 30 yards, but Seattle’s running backs didn’t have a run go for more than 4 yards. Fuller continues to dazzle since he returned from a collarbone injury that kept him sidelined the first three games of the season. Since 1991, no player has reached seven TD receptions in fewer total receptions than Fuller. Fuller now has seven TDs on 13 receptions this season. Texans: Houston was already thin on the defensive line with both Joel Heath and Kendall Langford inactive. The Texans lost Christian Covington to an elbow injury suffered early in the second half. Seahawks: Thomas appeared to hurt his hamstring on Hopkins’ long TD in the fourth quarter. Texans: Houston returns home to host Indianapolis next Sunday. Seahawks: Seattle stays at home and will host Washington next Sunday.